BATON ROUGE, La. 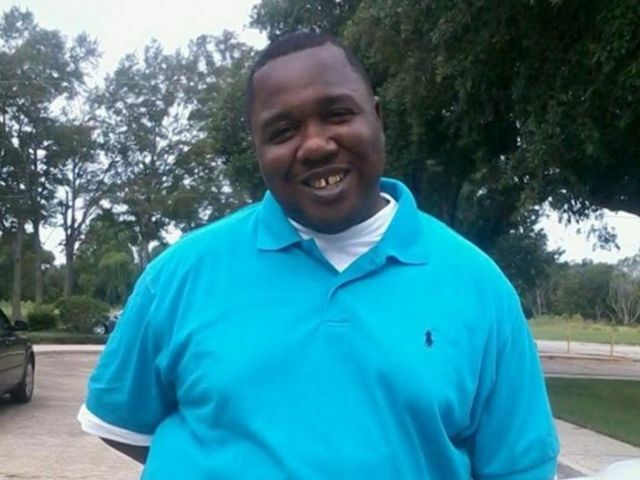 (AP) — An emotional, at times angry, evening unfolded in the working class, predominantly black Louisiana neighborhood where the police killing of a black man was caught on videotape. "I'm angry, but I'm not angry enough to hurt nobody," Augustus said. "I'm not angry enough to go into the street. I'm not angry enough to curse the police out. But I'm angry and I'm mad because they took something from me that I never ever will get back." Terrance Carter, Sterling's 28-year-old nephew, wore a T-shirt with his uncle's image printed on it. The police, he charged, went way too far. "They did it wrong," he said. "They could have handled it better than they did. They didn't have to shoot him!" "The family just wants it to be peaceful," he said. "I understand right now it's bigger than us, but at the same time we're just trying to work through this and be smooth with it." "Something is profoundly wrong when so many Americans have reason to believe that our country doesn't consider them as precious as others because of the color of their skin," Clinton said. It was not clear from the murky cellphone footage whether Sterling had the gun in his hand or was reaching for it when he was shot. A witness said he saw police pull a gun from Sterling's pocket after the shooting. Baton Rouge Police Chief Carl Dabadie Jr. said Sterling was armed — Dabadie didn't specify the type of weapon — but that there are still questions about what happened. Someone yelled, "He's got a gun! Gun!" and one officer pulled his weapon from his holster. After some shouting, what sounded like a gunshot could be heard. The camera pulled away before more shots were heard. The store owner, Abdullah Muflahi, released a video that he said he shot from a slightly different angle. He said Sterling was not holding a gun during the shooting but that he saw officers remove one from his pocket afterward. His video shows an officer reaching into Sterling's pocket to grab an object. Muflahi said an officer fired four to six shots into Sterling's chest. The street protest continued into the night Wednesday. People danced on cars and trucks, blocked traffic, and demanded justice. The protests were peaceful, and there was no sign of police even as the protests blocked a thoroughfare through that section of Baton Rouge. "It's hard out here for a black man in 2016," she said. "I don't want them to feel scared to stand up for their rights." "It's peaceful right now, but if the people don't get what they want, it might get like Ferguson," she said. She said she spent some time protesting in Ferguson, Missouri, after the controversial police shooting of Michael Brown, a black man who was unarmed. "People will get frustrated if they don't get answers." The Justice Department will look into whether the officers willfully violated Sterling's civil rights through the use of unreasonable or excessive force. Similar investigations, which often take many months, were opened after Brown's shooting in Ferguson, Missouri, and following Eric Garner's chokehold death in New York City.